After recently adding an Upper King Street tour, Charleston Culinary Tours is pleased to bring a 1.5 hour Mixology Tour that introduces guests to some of Charleston’s best cocktail crafters. Each Mixology excursion stops at three watering holes where guests will meet the magicians behind the bars that are mixing the lowcountry’s most exciting, innovative and delicious drinks. Tour participants will have an opportunity to sample a specialty craft cocktail at each of the three stops after learning about the art of mixing cocktails and gaining insight into how Charleston’s mixologists are embracing traditional techniques while also taking ingredients from farm to tumbler. 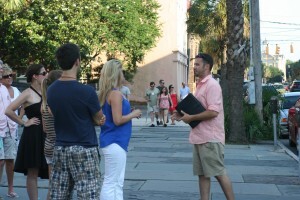 During walks between stops, a guide provides insight into Charleston’s cocktail culture, both past and present. Limited to 14 guests, advance mixology tour tickets are $40.00 per person and available at eTix. Charleston Culinary Tours combine the best of Charleston history and food with unique historic tours that highlight the local cuisine. Held rain or shine, there are four tours that include Historic Downtown, Upper King Street, The Farmer’s Market and Mixology. Each Charleston Culinary Tour visits several different restaurants, bars or the Farmer’s Market to combine elements of a historical tour with a culinary adventure. The food and drinks on the tours are chosen by various restaurant and bar partners and feature an array of eclectic dishes and concoctions that provide insight into Charleston’s cuisine and cocktail scene. On each tour, you will not only have an opportunity to sample some of the Lowcountry’s finest offerings, but also to meet the owners, chefs and mixologists behind Charleston’s impressive culinary and bar innovations.